Did Brown Cell Out Privacy Rights? 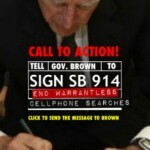 California Governor Jerry Brown disappointed privacy advocates with his October 9 veto of a bill which would have required law enforcement officers to have a warrant before searching cell phones incident to an arrest. The bill, Senate Bill 914, sailed through the Legislature with a 32-4 Senate vote and unanimous 70-0 support in the Assembly. It would have overturned a California Supreme Court decision, People v. Diaz(2011) 51 Cal. 4th 84, which held that a search of a defendant’s cell phone incident to an arrest was lawful, even without a warrant, because a cell phone is like an article of clothing. Dissenting Justice Kathryn Werdegar argued that, “The potential intrusion on informational privacy involved in a police search of a person’s mobile phone, smartphone or handheld computer is unique among searches of an arrestee’s person and effects,” because a smartphone can contain hundreds of thousands of messages, photographs, videos, maps, contacts, financial records, memoranda and the like. In my view, the dissent raised valid reasons why a warrant should be required to search cell phones, and Justice Werdegar acknowledged that “where the arresting officers have reason to fear imminent loss of evidence from the device, or some other exigency makes immediate retrieval of information advisable, warrantless examination and search of the device would be justified.” The Legislature’s overwhelming approval of SB 914 indicates strong support for requiring, under California law, warrants to search cell phones. Let’s hope the Legislature takes another crack at this one — I would not be at all surprised if the bill is introduced again, perhaps with some changes — and finds a way to address Governor Brown’s concerns.